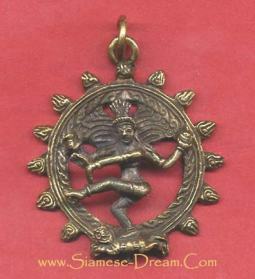 This brass dancing Shiva Statue is made in India, and is available in three sizes; either an 8.5 inch tall, a 9.5 inch, or a 14 Inch tall statue. These Dancing Shiva Statues depict the Hindu God of Destruction in a cosmic dance of energy; it is said that the energy Shiva provides when he dances is what sustains that universe. 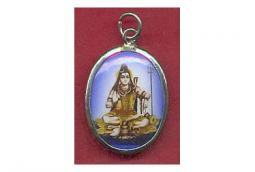 When Shiva tires of dancing and stops, the universe will lose its energy and will dissolve. 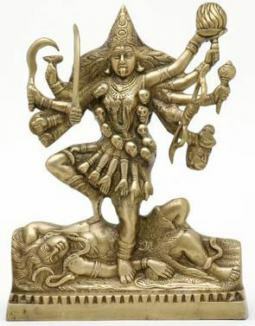 In this statue you can clearly see Lord Shiva standing on a demon with one foot, while another leg is raised and the left arm crosses in front of Shiva's body in a posture of Power. If you watch traditional Indian dance, such as Kathak, you will notice that this Dancing Shiva pose is replicated in many of their dance moves.